Software News tagged "Marketplace Product Repricing"
Amazon repricing tool BQool Repricing Central has increased its repricing frequency to four times per hour. BQool's new "Accelerated Repricing" is able to reprice approximately once every 15 minutes. "By offering our customers the option of Accelerated Repricing, it gives them the upper hand over their competitors in terms of repricing frequency," says Peter Kuo, Business Relationship Manager at BQool. "Always keeping on top of price rankings can ensure customers a better chance at winning the Buy Box and also staying in the Buy Box." It's a challenge when trying to improve the speed and effectiveness of a repricing software as Amazon regulates how often sellers can change prices. "With Accelerated Repricing, we've produced a repricer that can run at maximum efficiency," says Peter. "We're also comfortable in telling our customers and the public our repricing frequency, as this is a product we are confident in, something we are able to guarantee our customers that we can achieve for them." The Accelerated Repricing feature is available for sellers on Amazon US, CA, and EU (UK, DE, FR, IT, ES) subscribed to the Deluxe plan or higher. Multichannel management tool Seller Dynamics has a new feature which automatically reprices eBay listings. The new eBay repricer, also known as #DAVE, uses the eBay catalogue to find competing items. After importing stock, and setting upper and lower price points, Seller Dynamics will dynamically adjust prices up and down in line with the competition. Alex Ogilvie, Seller Dynamics' Managing Director, said "It's the only automatic eBay repricer from a 'full blown' marketplace management system. It works in tandem with Amazon and Fnac, so one set of margins can be used across multiple markets if that suits the sales strategy, making it a breeze to use." "We'd been asked by customers about eBay repricing, so saw an obvious demand. Because we have telephone based account management and support we find out quick where innovation is required. The underlying system is designed to be extended, so it was just a matter of prioritising the development work and getting it done. We're really benefiting from a system that's been designed with extensibility front of mind. Becuase of that there are a number of cute things coming down the pipe for 2015, eBay auto repricing is the first." Amazon dynamic pricing solution Feedvisor has updated their recently launched Revenue Intelligence Dashboard with a new "Unrealized Profit" alert. Feedvisor's monitoring identifies items that are winning the Amazon Buy Box, but could be winning it at a higher price without affecting sales volume. The "Unrealized Profit" alert highlights those items that could be sold for a higher price but are restricted by the ceiling price which the seller has set. The Unrealized Profit alert exists alongside four other alerts, which highlight items that are not selling or selling too fast, for example. The Dashboard also enables sellers to see a high-level view of their key performance numbers such as sales and profitability. 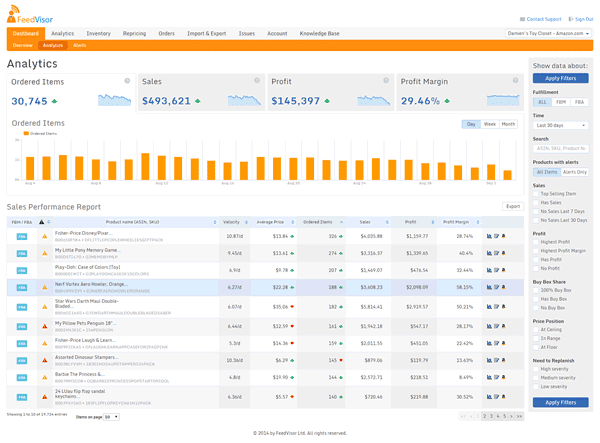 Pricing optimization company get4it has launched a new "pricing intelligence" platform. Founder and CEO James DeBoe said, "This launch has incorporated three main areas of functionality; Connectivity, Repricing, and Marketplace Intelligence. As we execute our road map our customers will notice a strategic focus on these three areas. get4it will, in a very short period of time, connect to every major marketplace and popular cart offering, as well as offer ever more intelligence, not only around pricing, but also many other metrics that are proven to increase online retail sales." get4it connects to a merchant's sales channels, imports inventory data, and calculates the optimal competitive selling price. 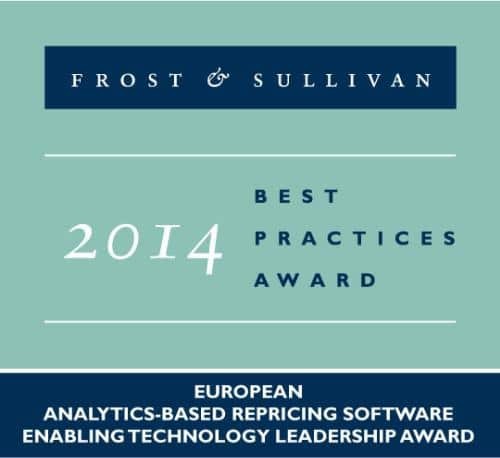 Algorithmic Amazon repricing solution Feedvisor has won an award from business consultancy Frost & Sullivan for "Enabling Technology Leadership". The award was based on Frost & Sullivan's research into the analytics-based repricing software market, which concluded that Feedvisor repricing platform offered key advantages ahead of competitors (who were not named in the report). "Feedvisor employs self-learning algorithms that adapt to various business objectives, thereby completely eliminating the need to define pricing rules or change the rules periodically," said Frost & Sullivan Research Analyst Sathya Vendhan. "Furthermore, as it is not dependent on rule definitions, it can be evolved for use in accurate repricing of stock options when financial laws and rules change often." Each year, Frost & Sullivan presents this Award to a company that has developed a pioneering technology that not only enhances current products, but also enables the development of newer products and applications. FeedVisor also won a Red Herring award this year, in April. Marketplace repricing system Feedvisor has released a new Revenue Intelligence Dashboard which shows in-depth business information and alerts. The Dashboard, designed for high volume Amazon merchants, uses self-learning algorithms to display the most useful information. It is the first of its kind for online marketplace sellers, says Feedvisor. Feedvisor's Vice President of R&D Eyal Lanxner said, "Feedvisor's self-learning algorithms collect and analyze a massive amount of information from thousands of data points, which have until now been used to drive our repricing platform. We have now opened up this rich data to our customers in a clean and intuitive way, providing them with a level of knowledge they simply did not have access to before. Our new Dashboard delivers critical business insights and adaptive alerts, which will play a key role in the day-to-day management of a retailer’s online business." Feedvisor’s algorithms automatically analyze the competitive environment, product demand, and price elasticity of every product in a seller's inventory. For example, the Dashboard will highlight items that are not selling or selling too fast, show why this is happening, and enable sellers to make any necessary changes. The new Dashboard has been developed with input from Feedvisor's customers, and tested by selected Amazon Marketplace sellers. As part of the launch, Feedvisor is offering high volume Amazon sellers the chance to try it out free for 14 days. Provider of automated repricing for Amazon sellers Feedvisor has updated their popular guide to winning the Amazon Buy Box. The September 2014 edition of the Buy Box Bible has been updated for recent Amazon changes, and includes new sections on the mobile Buy Box, Featured Merchant status, new Amazon terminology, and practical tips for improving seller feedback. A summary from the original Buy Box Bible is included in Web Retailer's Marketplace Repricing: The Ultimate Guide. The new Buy Box Bible can be downloaded here (name and email required). Repricing tool for Amazon marketplace sellers Feedvisor has raised $6 million of venture capital funding. The investment was led by Square Peg Capital, and follows a $1.7 million round in October 2013 by JAL Ventures, Oryzn Capital and Micro Angel Fund, who also participated in this round. Feedvisor CEO and founder Victor Rosenman said, "Combining Big Data technology with machine learning algorithms has led to drastically increased performance levels for Feedvisor's clients, with up to 500% increase in their sales and 40% increase in their profit margins. With this substantial funding round we are looking to further evolve our pricing algorithms and continue developing our BI platform, to optimize every aspect of the retailer's business operation." The Feedvisor platform manages inventory worth over $1 billion, says the company. More details have been released on how the XSellco Repricer Buy Box Predictor works. The company says multiple factors are used in their prediction algorithm, and given a weighting to help decide the probability of winning the Buy Box. For example, the FBA weighting makes an FBA seller more likely to win the buy box than a Merchant Fulfilled seller, even with a higher price. Other factors taken into account are feedback count, feedback percentage, availability of expedited shipping, time to despatch, and the "despatched from" location. Amazon repricing tool Sellery has added support for custom data fields. 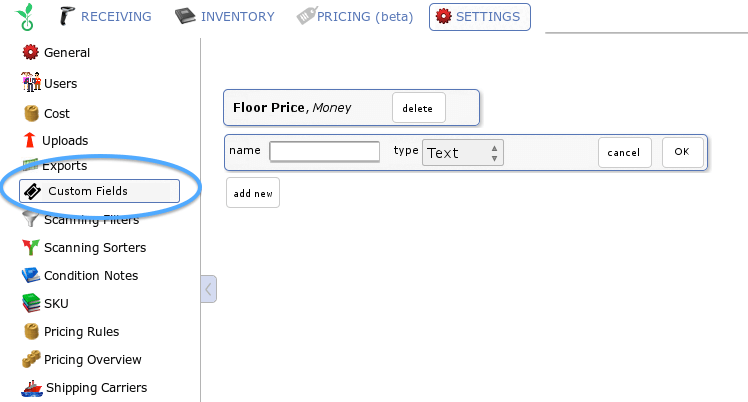 The custom data fields have many uses including minimum-pricing restrictions (MAP), product tagging and unique ceiling and floor prices. Numerical custom data fields can be used in Sellery's repricing rules. Amazon repricing tool XSellco Repricer has released a new feature called the "Buy Box Predictor". The new feature shows a red, amber or green indicator on all inventory to indicate the likelihood of each item winning Amazon's Buy Box. Inventory can be filtered by Buy Box Predictor status, and action taken to increase the probability of winning the Buy Box. Amazon dynamic repricing tool Sellery now supports pricing rules that vary depending on whether the current Buy Box offer is fulfilled in-house or through FBA. Sellery has also added a new tab in their inventory view, which shows for each product the lowest used and new prices, as well as the current Buy Box offer and fulfillment channel used. An automatic repricing tool which is completely free for an unlimited number of SKUs (product lines) has been launched by XSellco. The XSellco Repricer updates every eight hours and reduces prices to match the competition until it reaches the seller's minimum price. An "advanced" version has real-time repricing, calculated minimum prices and support for eBay items with catalogue IDs. Amazon repricing solution Feedvisor is a finalist in the Red Herring Top 100 Europe Awards. "We are extremely pleased and excited about being selected as a Red Herring Finalist," said Feedvisor’s Co-Founder and CEO, Victor Rosenman. "We’ve worked extremely hard to get to the stage where we’re at and in the last few months especially, we’ve made massive strides, developing and fine-tuning our product as well as exponentially increasing our customer base. Being considered for a Red Herring Award is testimony to this hard work and a great honor for us." The awards take place in Amsterdam in April, bringing together 250 technology entrepreneurs and investors from across Europe. Winners are selected by Red Herring’s editorial team. Marketplace management provider ChannelAdvisor has enhanced its Amazon repricing feature by using the Amazon's Subscriptions API, in their March software update. Use of the Subscriptions API means that repricing can happen immediately, in response to competitors' price changes. ChannelAdvisor will monitor products on Amazon and reprice only when there is a change. Users can also exclude specific competitors by name now, and will see sellers' names and FBA status in repricing reports. Amazon repricing tool Sellery has added support for the cost of sending products to Amazon fulfillment centers, and improved their commission calculations. New tabs allow users to choose between merchant-fulfilled shipping or FBA, and to set the cost of shipping items to an Amazon fulfillment center. Sellery has also changed their method for calculating Amazon's sales commission, and takes into account minimum and variable commissions. Amazon marketplace repricing tool RepricerExpress will be launching support for Rakuten Play.com in early 2014. Also on the roadmap are integration with the Amazon Subscriptions API for faster price updates, and options for continuous repricing and custom frequencies. RepricerExpress is also running a survey asking what other features users would like to see developed in 2014. Amazon repricing service Feedvisor has been nominated for a Crunchie technology innovation award. The Crunchies are annual awards hosted by Gigaom, VentureBeat, and TechCrunch that recognize the most compelling startups, internet and technology innovations of the year. Feedvisor has been nominated in categories including Best E-Commerce Application and Fastest Rising Startup. The Crunchies award ceremony takes place on Monday, February 10, 2014 at Davies Symphony Hall in San Francisco. Dynamic repricing solution Feedvisor has raised $1.7 million in venture capital funding, to further develop the product and grow globally. "Over the past year, Feedvisor have emerged as the clear leader in the Dynamic Pricing space, representing a new wave of Big Data companies using machine learning to make automated, accurate and time-critical decisions" commented Joshua Levinberg, Managing Partner of JAL Ventures, who will be joining the company’s board of directors. "Feedvisor have put together an amazing team of talented, dedicated individuals, and we are confident this investment will help them expand their product offering and rapidly penetrate new markets." Feedvisor differs from the majority of automatic repricing tools by its use of a self-learning algorithm rather than seller-configured repricing rules. Multichannel management solution Etail Solutions has added a number of new features and pricing strategies to their Amazon repricing system. The new system uses Amazon's Subscriptions API to provide fast repricing in response to competitors' price changes. Pricing strategy can be targeted to a specific position or against certain competitors, while maximizing profit by adhering to a minimum profit margin, beating competitors by the minimum possible, and automatically taking into account Amazon commissions. Etail’s CEO Michael Anderson stated "We feel as though we have had a competitive edge on repricing for some time now. However, with the recent modifications made available by Amazon, when combined with our architecture, we now have the ability to provide our merchants with incredible competitive intelligence and capabilities which will have a substantial positive impact on sales." eBay has acquired price-forecasting startup company Decide.com. The company's technology will be used to build pricing tools for eBay sellers, to help price items competitively and decide on the best selling format and options. Existing tools serving the same needs include dynamic repricing and marketplace analysis services. Decide.com, which will be closed at the end of September, advises consumers on whether they should buy a product now or if the price is likely to drop. Amazon repricing tool RepricerExpress is working on an integration of Amazon's new Subscriptions API, which will add to the features available in the software. Seamus Breslin of RepricerExpress explained "Whilst it remains to be seen how the new Subscriptions API will impact repricing costs, reliability and frequency (has throttling limits like the Products API) there is little doubt it will make repricing software even better and more accurate for sellers who use those solutions that integrate with it." Amazon, eBay and Play repricer Appeagle is also developing an integration of the new API. The team behind marketplace management tool SellerExpress have released a separate dynamic repricing product for Amazon sellers, called RepricerExpress. John Hayes, a non-executive director at the firm said: "Within SellerExpress we believe we have the best repricing system on the market today. We wanted to make this technology available to everyone regardless of what multi-channel retail system they are using." Packages start at £30 for up to 2,500 SKUs and there is a 15 day trial. RepricerExpress has been scheduled for addition to our directory. Version 2.0 of dynamic marketplace pricing system Feedvisor adds an artifical intelligence repricing algorithm and actionable analytics to its platform. "This new version of our algorithm combines Big Data with machine learning. It looks at a much broader market environment and analyzes a considerably greater historical dataset than we've ever looked at before, to fine-tune prices and optimize profits," said Victor Rosenman, founder and CEO of Feedvisor. "Our platform uses a closed-loop, learning algorithm. This means that with every sale that goes through our client's account, continuous adjustments are being made that increase the accuracy of our solution for each specific product." 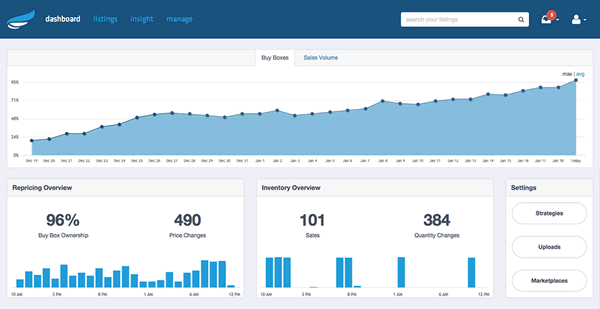 The new version also introduces analytics and alerts to provide insights and add transparency - sellers can now see which items are not selling, which are not priced competitively, and which are having a spike in sales and will soon run out of stock. Marketplace management solution Seller Dynamics have introduced a product repricing tool for Rakuten Play.com, which they claim is the market's first. The feature checks inventory against competitors and dynamically reprices unlimited SKUs multiple times per day. Seller Dynamics' Business Development Manager Steve Boland said "Our clients have benefited greatly from our best-of-breed dynamic repricing feature on other marketplaces, so we're thrilled that we’ve been able to replicate this for Play.com. Even if prices are set at pennies lower than competitor prices, this could make the difference in closing a sale, while automatic upwards repricing to sit just below the nearest competitor ensures our clients will always be earning the maximum possible margin from their sales." The latest ChannelAdvisor release includes new features for the overhauled Google Shopping, and an enhanced Amazon marketplace repricer. ChannelAdvisor's Google Shopping management tool tackles the challenge of managing and optimizing Google's Product Listing Ads (PLAs) - which replace Google's free comparison shopping listings. "Google has been one of the most successful marketing outlets for our customers, and the launch of Google Shopping presents an exciting opportunity for us," commented Scot Wingo, CEO of ChannelAdvisor. "Our experience in the industry and established technology allowed us to respond to the new Google Shopping program with a powerful feature that will help retailers be more strategic and successful on this essential online channel." The improved Amazon repricer introduces control over repricing frequency so popular (or particularly competitive) items can be repriced more often, and a preview feature which shows the result of specific repricing rules compared to other retailers - before repricing actually takes place. "Price is one of the determining factors in winning the Amazon Buy Box, so we have made some powerful changes to our Repricer feature," commented Link Walls, director of product management at ChannelAdvisor. "With the ability to employ advanced strategies, the Repricer is helping our customers succeed and be more profitable on Amazon." Marketplace Repricing is a pricing intelligence and repricing solution that also offers Amazon consulting.